“Being a great lover of nature, an especially of wild flowers and plant life, it was her desire that one part of our park system should be left in its natural condition and devoted to the wild flowers and birds of our state. Under her loving care for many years, this garden has become famous and given pleasure to many." Alfred Pillsbury, President, Minneapolis Park Board, May 5, 1933. During those years in Minneapolis, she pursued her interest in botany by attending classes at the University of Minnesota, collecting, editing and working for certain professors, botany trips to Jamaica, Woods Hole, and the University's new research station on Vancouver Island. She was a member of the Gray Memorial Botanical Chapter, (Division D ) of the Agassiz Association and frequently submitted articles for publication in the Asa Gray Bulletin. Some of those articles are referenced later in this text. Photo above: Figure 1: Eloise as a young woman, ca 1890s. Blanch's Studio, Minneapolis. 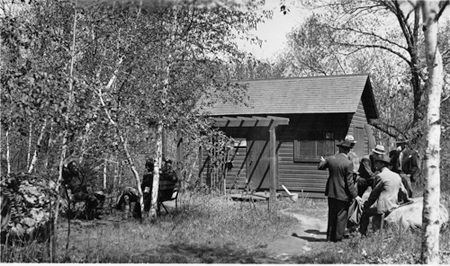 As early as the 1880s observant people realized that the development of the city of Minneapolis was incompatible with the retention of native habitat. West of the city in the Saratoga Springs Addition, residents successfully petitioned the new Minneapolis Park Board to obtain a segment of that area to preserve for future generations. Named "Glenwood Park" and with adjustments in size over the years, this became what is now Theodore Wirth Park. A small section of this new park was particularly attractive to Eloise and her teacher colleagues. They were having great difficulties familiarizing their students with plants growing in their natural surroundings, as development was wiping out these areas. A 1907 newspaper reporter wrote: “There was a time, and not so long ago, that some Minneapolis families could pluck these rare wild flowers almost from their back doors, but when too many people took a hand in the culling and the plucking became a massacre, the plants grew discouraged and disappeared.” (pdf copy) This spot in Glenwood Park would be accessible and attractive for that purpose. 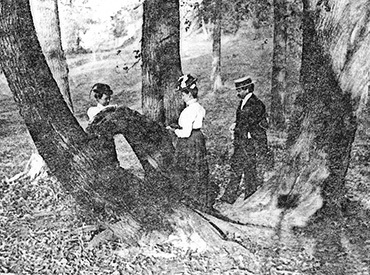 Below - Figure 2: Eloise Butler (center) with a Mr. Simmons and unidentified woman studying a natural tree graft near Glenwood Springs, ca. 1900. As the Park Board had done little with the entire park due to lack of funds, this small group decided that something must be done to protect the unique native flora of the small area they had selected. That area included a swampy bog, fern glens, hillsides, upland hills and trees and nearby, the Great Medicine Spring. In 1907, after a petition from a group of teachers and other citizens (pdf copy of documents) the Park Board was moved to set aside a portion of this area as a Natural Botanical Garden but soon it was known as the Wild Botanic Garden (as the partially visible sign in fig. 3 below states). The initial area designated was only about 3 acres. A newspaper article from 1907 gives more detail of why it all came about. (PDF copy). Eloise became the most prominent guardian and promoter of this natural space. After 1909, she spent each growing season in the Garden, living with friend Jessie Polley in south Minneapolis from 1912 to 1915 and then she took up lodging just North of the Garden at the J. W. Babcock house at 227 Xerxes Avenue. In the fall, the garden closed on September 30th and each year Eloise, in mid-October, returned East to 20 Murray Hill Road in Malden, Massachusetts, to stay with her sister Cora. 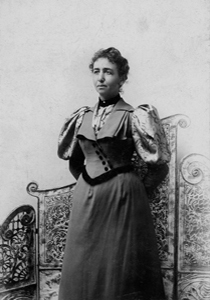 Prior to 1910, while still teaching, she had returned to Malden in July and August each year. It was originally believed that the Garden, with its naturalist approach, was the first of its kind in North America, but soon after its creation there was an account in the Boston Transcript of a similar garden near St. John, New Brunswick, in Canada that was established 20 years prior by botanist Dr. George Upram Hay. He had established a two acre "wild garden" on his summer property at Ingleside near Westfield, where he maintained more than 500 species of flowering plants. These were for the benefit of students and those who study plants. It was not a public garden, but the concept was the same. Martha Hellander's research indicates that the Wild Botanic Garden in Glenwood Park was certainly the first natual wild flower garden in the United States and as a public garden, probably the first in North America. A document in the archives of the Minneapolis Park & Recreation Board, titled "Our Native Plant Reserve" by Mrs. John Jepson, gives more detail on the origins of the Garden. Most of the detail in this short history appears to be taken from the notes of Eloise Butler that are preserved in her written documents "Annals of the Wild Life Reserve." Details about that below. This document itself was published in June 1933 following her death, in The Minnesota Clubwoman. 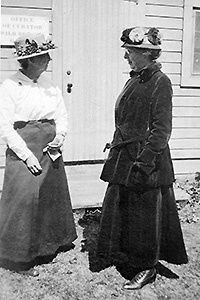 After her retirement from teaching in 1911, a petition by the Conservation Committee of the Minneapolis Woman’s Club to appoint Eloise as the Garden Curator was presented to the Park Board. They approved the petition along with a very small salary. The enhancement of the garden with the planting of additional native species then gathered full steam in the hands of Eloise Butler. While the peak years for plant acquisition were 1912-1916, the acquisition of and replacement of species was a continuous process as it remains today. Eloise would rescue plants from development areas and source them from nearby sources such as the Quaking Bog and local street sides. The Quaking Bog is also located in Theodore Wirth Park, on the west side of Theodore Wirth Parkway, opposite the Garden. It is a hidden five acre acidic bog with mature tamaracks shading an under story of sphagnum moss much like the Garden bog was when the Garden was set aside as a preserve. It was also her practice to import plants not growing in the area that she thought would grow there, even if they were not native to Minnesota. She sourced many plants from nurseries in other states, particularly nurseries she was familiar with from her families home states of Maine and Massachusetts. Promotion: As part of her crusade to raise public awareness of the Garden, Eloise began to write for publication. In 1911 she wrote, in a weekly series, 22 articles about native plants that was published in the Sunday Minneapolis Tribune. She also gave Garden tours. In the following years she published numerous other articles. Between 1910 and 1918 she put on an exhibit about the Wild Botanic Garden in the horticulture building at the State Fair. You can read her 1911 weekly articles in our Education Archive. In addition, they are also found in Martha Hellander's book The Wild Gardener, along with a large number of her other writings. Many of these are also found in the our Site Archive. In August of 1913 Minneapolis hosted a convention for the American Florists and Ornamental Horticulturists. Eloise supplied a display of native wild flowers - whichever ones nature deemed to provide at meeting time. (HTML version of her report). Her January 1914 letter to Parks Superintendent Theodore Wirth - summarizes why the Garden is so important and so enjoyable. “Another cause for congratulations is the generous extension of the Garden limits by the addition of an adjacent hillside and meadow. The labor of the curator would be materially lightened if the garden were fenced and more warning signs posted. Her work consisted of conducting visitors, exterminating pestilent weeds and protecting the property from marauders. For “ ‘Tis true, ‘tis pity, and pity ‘tis, ‘tis true” that a small proportion of our citizens have not yet learned to name the birds without a gun, or to love the wood rose and leave it on its stalk.” [Nov. 8, 1912]. The Garden was not protected by any fence until 1924, and then only partially. Although the initial action by the Park Board in creating the Garden called for a fence, there is no indication one was ever put up. (fencing details) A fence was a necessary step to keep out interlopers, "spooners", and destructive animals, such as the neighboring hog. Eloise had the fence put up herself in 1924. Today the neighboring hog has moved well away but the white tail deer have moved in and it requires consistent fence maintenance to keep them out. Natural calamities affect the garden as well. 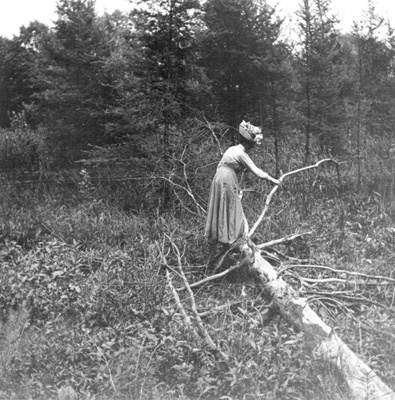 In fig 6 at right we see Eloise near a stand of birches, many of which were lost in a destructive tornado of June 2nd 1925. In more recent years the loss of many elms to Dutch Elm Disease and oaks to oak wilt has left some areas without the tree canopy that sustained the habitat beneath, resulting in changes in the Garden's appearance and habitat. "If any one comes upon her suddenly, at a quick turn in the path, her first thought is to exclaim: 'do not step off the path, be sure to come this way along this foot path so as not to step on those geraniums,' or it might be gentians if it is fall, or bloodroot if it is spring. These flowers are her family." I found Miss Butler very much in evidence. Her greeting was a peremptory challenge: “Young man!” The mien and vocal quality were those of a teacher addressing an erring pupil. About 1918 a young woman named Martha Crone entered the scene. 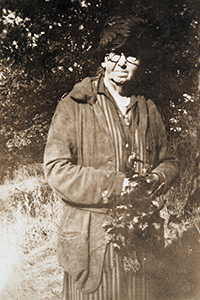 Her connection to the Eloise Butler Wildflower Garden and later to her assistance in founding The Friends of the Wild Flower Garden are linked back to her innate loving response to wild things and their place in the environment. Like most people who devote a passionate lifetime to the pursuit of a certain subject or hobby, she was largely self-taught about wild plants and birds. Her first contact with the Garden was as an inquisitive and persistent visitor, extracting information from Eloise Butler and in turn bringing in specimens and providing assistance to Eloise. 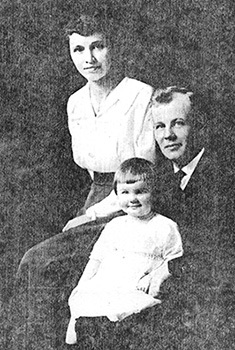 Martha and her husband William, a dentist, lived at 3723 Lyndale Ave. North in Minneapolis. Together, they were avid explorers of plant habitat and especially mushroom habitat. Martha was secretary of the Minnesota Mycological Society from 1926 onward for a number of years. 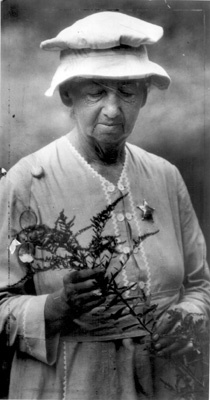 Considering the need for large numbers of plants for the developing Wildflower Garden, the Crones were able to provide good assistance to Eloise Butler in finding sources for wild plants and for rescuing plants from areas where the native habitat was soon to be overrun with development. Winter correspondence between Eloise and the Crones started in the early 1920s and continued to the end. In Eloise Butler's early years at the Garden, she referred to it as "The Wild Botanic Garden" for two reasons. First, she maintained it in a "wild" state, such as the plants might appear in the natural environment. Second, she wanted to establish which plants would grow well in the climate of the Garden, even if they were not native - hence - it was a 'botanic' Garden. This second reason was slightly contrary to the original stated purpose "to display in miniature the rich and varied flora of Minnesota." (pdf - 1907 documents) The first premise has been maintained to the present day. The second was abandoned at the end of Martha Crone's time when it was established that only plants native to the area should be present. A second name appeared fairly early in Eloise Butler's time - "native plant reserve." One finds references to that name in 1933. [see Jepson article] Martha Crone and later Ken Avery used the term 'reserve' when speaking of the Garden. In an essay Eloise wrote in 1926 [The Wild Botanic Garden - Early History] she explained why the second name was chosen: “It was soon found that the term “Wild Botanic Garden” was misleading to the popular fancy, so the name was changed to “Native Plant Reserve,” even though she was bringing in many non-native species. fig. 7 above. 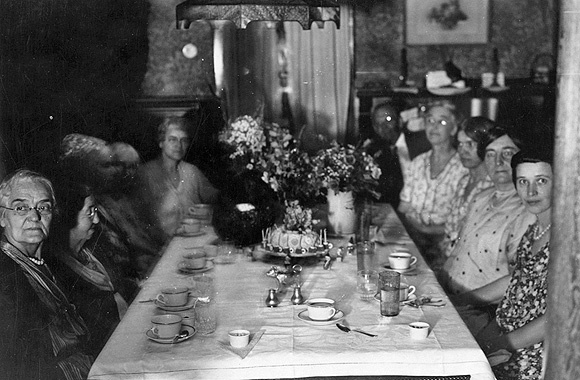 A gathering of friends on her 80th birthday, August 3, 1931. 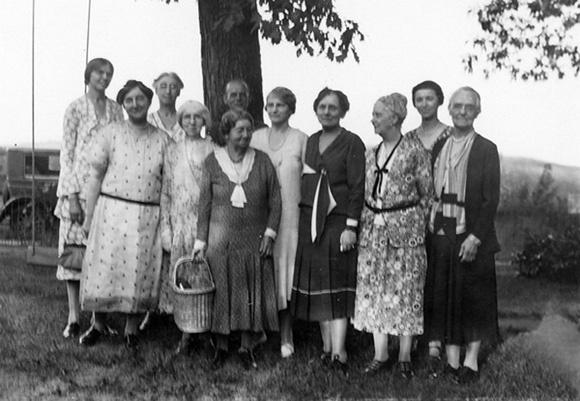 From l to r: Miss Alma Johnson, frequenter of the Garden; Mrs John Hadden, a former pupil; Mrs. J. W. Babcock, in whose house Eloise lodged while in Minneapolis; Miss Clara K. Leavitt, fellow teacher; Eloise; Dr. W. H. Crone (behind Eloise); Miss Elizabeth Foss, botany teacher at North H.S. ; Miss Mary K. Meeker, former pupil; Mrs. O. F. (Edith) Schussler, former pupil; Mrs Crone (Martha); Mrs. Louisa Healy, former pupil. Photo: Minnesota Historical Society, Martha Crone Papers. fig. 8 below: Following the outdoor photo above, the gathering moved indoors to the J. W. Babcock House at 227 Xerxes Ave. where Eloise boarded during the time that the Garden was open. The seating arrangement here is: Left side front to back - Mrs. Louisa Healy, Eloise Butler, Mrs. Schussler, Miss Leavitt and Miss Foss. Right side, front to back - Martha Crone, Mrs. Hadden, Miss Johnson, Mrs. Babcock and Dr. Wm. Crone. Photo: Minnesota Historical Society, Martha Crone Papers. In fig. 9 at the left, we see Eloise crossing the rustic bridge at the north end of the Mallard Pool. The year is 1932. She has physically weakened due in part to neuritis and from burns received in 1929 when a heating pad caught fire while she was sleeping. Her doctors advised her that the burns would always be covered with scar tissue, not true skin, so they would always be somewhat uncomfortable. The development of this pool was long on gestation and short on actual building. She had dreamed for many years of creating an aquatic pool for special plants and the site, at what was a meadow north of where the current Garden boundary ends, where water from the wetland drained out into an open meadow. 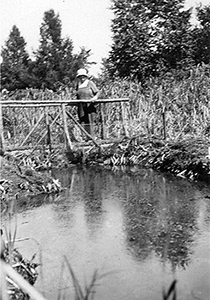 She could not move the idea to reality until 1932 when the pool was quickly constructed by an unemployed man and another was employed to build a rustic bridge of tamarack poles to span the narrow lower end of the pool. When a mallard was soon seen in it, it became the “mallard pool.” Eloise had planned extensive plantings around the pool and these were completed by Martha Crone in 1933. That pool is no longer within the boundary of the Garden as the area was abandoned by 1944, but the Garden does contain a pool, in the same place where Eloise originally created one in the Garden's first years, which has acquired the same name. More details about the wetland and the pools will be found in our article "The Wetland at Eloise Butler Wildflower Garden" and in particular in this detailed article about the original Mallard Pool (PDF). The End of a Long Career and the myth of her death in the Garden. figure 10: Eloise Butler in her last years. 1932 turned out to be Eloise’s last full year as curator. She wanted to retire but had been unable to find a replacement. While at Malden she wrote what would be her last letter to the Crones on Jan. 11, 1933 in which she thanked them for the Christmas gifts they had sent and she attached copies of correspondence from Pearl Heath Frazer which she wanted the Crones to keep for her as she (Eloise) may want to show it to Mr. Wirth upon her return to Minneapolis. The correspondence was about Mrs. Frazer taking on the job of Curator so that Eloise could retire. Eloise had sent a letter, at the request of Parks Superintendent Theodore Wirth, to Mrs. Frazer on Sept. 29, 1932, explaining the job. Mrs. Frazer had replied to Eloise that that was not the sort of job she was interested in. (pdf of Eloise's letter to the Crones). Shortly after the new season of 1933 began, Eloise was back in the Garden doing what she could in her failing health. On the rainy morning of April 10, 1933 she attempted to reach the Garden from her lodgings at the J. W. Babcock's house (located just east of the Garden at 227 Xerxes Ave. No.). She apparently suffered a heart attack and made her way back to Babcocks (possibly with some help). A doctor was summoned but nothing could be done and she soon passed away on the couch in the entryway of the house at 2:15 PM. Her funeral was on April 12th, 12:45 PM at the Lakewood Chapel. On May 5th, her ashes were scattered in the Garden as had been her wish. fig. 10a. Eloise Butler ca. 1930, photo courtesy Minnesota Historical Society. 2. Interview with Lloyd Teeuwen, May 4, 1988 by Martha Hellander. Tape and transcript in the Martha Crone Collection, Minnesota Historical Society. Lloyd passed away on June 16, 1992. "For a full quarter of a century, her useful life has been spent in a labor of love..." Theodore Wirth, Superintendent. It is not unusual that the accomplishments of an individual are more clearly understood after that person has passed on. While certain people are "in-the-know" about what an individual is accomplishing, it is only after death, when congratulations are too late that the rest of world becomes aware of the qualities of the individual whose life is now past. 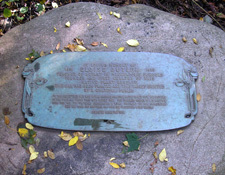 Theodore Wirth, Superintendent of the Minneapolis Park System, was probably the first to craft a brief but informative statement about the role Eloise Butler had taken on and played with such accomplishment. His letter of April 19, 1933, addressed to the Board of Park Commissioners informs them of her death and of her accomplishments. The letter announces the date for the remembrance ceremony to be held May 5th and also got the ball rolling on the commemorative tablet that was placed one year later. Complete text of Theodore Wirth's April 19, 1933 letter. That every member of the Board participate in the planting of the tree, and that the President of the Board perform the rite of spreading the ashes. About 100 people attended the ceremony. Mr. A. F. Pillsbury, President of the Minneapolis Park Board, officiated. The Pin Oak tree acquired by Superintendent Wirth was planted in her honor and her ashes were scattered within the area, as had been her wish. (The Pin Oak is difficult to establish there and was subsequently replaced with another.) Use this link to see the full report of the Ceremony: May 5, 1933 Remembrance Ceremony. Against the touch of vandal hand. At the end of the path from the front gate of the garden to the Martha Crone Shelter will be found a large granite boulder bearing a dedication to Eloise Butler. The boulder was placed the year following her death in front of the Pin Oak tree that was planted in her memory. 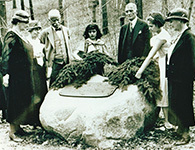 On the boulder is mounted a bronze tablet, dedicated on Arbor Day, May 4th, 1934. The oak is no longer there, but the boulder is sheltered by a large Leatherwood shrub - another plant she had sought out for the Garden. Her "occult" experiences in finding this shrub were described in this writing. Below: Newspaper photos from day of dedication. Click on photo for a larger image. In fig. 11 at the left we see a more complete view of the original curator’s office. This building, located on a flat plateau in the woodland part of the Garden was first erected in 1915 based on Eloise's design. It had two rooms and served as office, tool room, visitor center and for everything else. Prior to that date there was no shelter in the developing Garden, just a tool shed. The year of this photo is 1935. You will notice the small sign visible to the left of the door - it reads “Office of the Curator - Wild Botanic Garden,” even though that name had been discarded for some years prior. The Garden was officially renamed the “Eloise Butler Wild Flower Garden” on June 19, 1929. 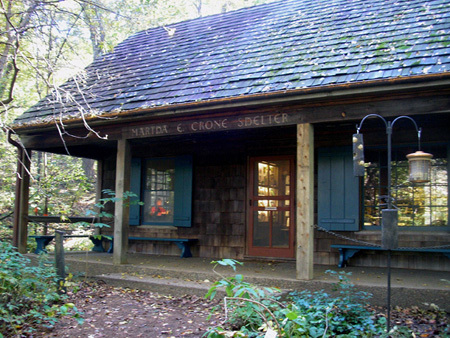 That old useful structure, becoming more rustic as each year passed, was finally replaced in 1969-70 with the current Martha Crone Shelter (fig. 12 at right), when the Friends of the Wild Flower Garden took on the major challenge of having a new structure designed and built. With much more room for the Garden Curator and naturalist staff, display areas, a fireplace and attic storage, this building still serves well today. The Garden Curator’s tool room has long since been relocated to a storage building/work room at the top of hill above the shelter and near to the front gate. Once the Garden was established in 1907, Eloise began writing about it. 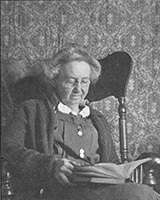 A number of her essays were published in various periodicals, newspapers and especially in the Asa Gray Bulletin of the Agassiz Association, of she was a member until her death. Those bulletins were circulated among members and various chapters of the Association and may be the principal reason why, as a newspaper article stated, that she was more well known elsewhere than locally. She also included much information in The Annual Reports of the Board of Park Commissioners. 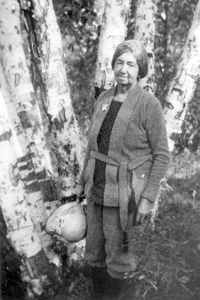 Over the years she wrote a number of columns for the local newspapers including a series of 22 in 1911, published in the Minneapolis Sunday Tribune, that described various plants in the Wild Botanic Garden. All 22 articles are available in html format in our Educational Archive, as are a number of those published in other venues. She also wrote many shorter articles that were never published. These essays began with a short autobiography and progressed to describing events that occurred in the Garden or on plant hunting excursions; some were observations on the characteristics of plants. Particularly memorable were her recounting of finding the Walking Fern and the White Lady's-slippers and what happened when her hat caught fire. Her intent was to group them into several series under the titles such as "Annals of the Wild Life Reserve". A number of these articles will also be found in the Archive. For a complete biography of Eloise Butler please see the book The Wild Gardener by Martha Hellander. This book is available by mail or web order from The Friends of the Wild Flower Garden. Click here to see a description of the book and to order. A short article on some common themes between these two gardeners. Here are some links to other sites with information on Eloise Butler. The first link takes you to the Minnesota Historical Society where there is a short biography of Eloise Butler, Martha Crone and also a complete inventory of documents that the Historical Society has in it's collection on Eloise and the Wildflower Garden. ©2012 Friends of the Wild Flower Garden, Inc. Quotations of Eloise Butler are from her various writings, from The Wild Gardener, by Martha Hellander, North Star Press Inc., 1992, used with permission, from newspaper articles and from documents in the Martha Crone Collection at the Minnesota Historical Society. Photos used with permission of noted source. Text by Gary Bebeau.